The longest running speedsailing event in the world opened its doors for the 36th year, held on the 500 metre strip in Portland harbour, Dorset. The history and heritage of this event attracts record number of entrants every year, with 2009 being no exception. 140 inscriptions included legendary windsurfer Anders Bringdal, Kiteboarders from all over the UK and WSW would not be the same without the wacky boats and experimental sailing craft that make it the most unique sailing event in the world. WSW continues to innovate and improve the event for the competitors. 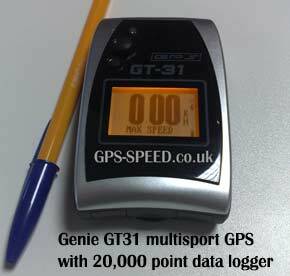 This year the organisers were given 10, Navi GT31 gps devices by gps-speed.co.uk and competition software from GPS Results to time the pro fleet. This was to ensure a higher level of accuracy and accountability to the top riders and take the pressure off the timers when recording the rest of the fleet. The data collection and system worked brilliantly with only a few minor glitches and recorded every run, with the top 3 riders separated by less than half a knot. It was fantastic to have such a high degree of accuracy which has never been achieved before at WSW. 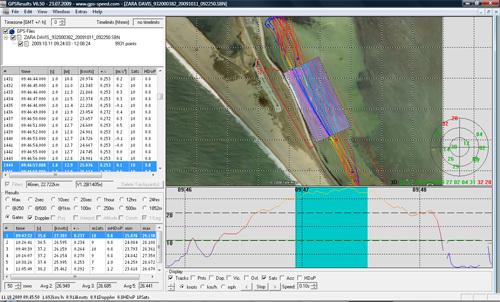 The plan for next year will be to run the whole fleet using GT31’s and the GPS results software. Unfortunately this year was not blessed with a great wind forecast but that did not stop the launch area filling with competitors all hoping for a good result. Saturday the opening day was a very light wind day with only 5 to 10 knots of wind but there was still a handful of keen sailors hitting the water some recording over twice the wind speed. 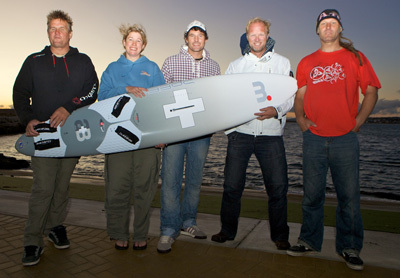 Of particular note was local girl Katherine Knight who achieved 18.35kts in her foil borne International Moth. The rest were happy to paw over all the demo gear available from Exocet, Tushingham, Starboard, Fanatic and soak up the sunshine catching up with old friends and convincing themselves how fast they could go if only the wind kicked in. To add to the buzz Mistral boards chose to unveil their new speed and Slalom board range at WSW and with “Mr Mistral” Anders Bringdal and his new UK Mistral team on hand Farrel Oshea, Dan Ellis and myself to answer questions it was well received. Sunday saw a much greater level of activity with a forecast of more wind, the rumour mill on how much was running overtime depending on which forecast you had seen. But the law of sod came to bear with only 14 to 15 knots average with the occasional gust up to 20+. This resulted in the top riders hitting 30+ knots, the fastest being the dark horse of the event Patrick Van-Hoof from Belgium achieving 30.13 knots which was very impressive given the wind strength and beating the favourites Anders Bringdal and Dan Ellis. I must admit I had it all my own way in the ladies fleet with winning 500m speed of 27.3 k on my new 78 litre Mistral Slalom board and Simmer SC4 Race sail, which put me 24th overall. The most competitive are always the Novice and Amateur fleets. These riders rightly get the major prizes of the event but can only win them once, which really adds to the excitement. The Novice winner was kiter Richard Fabbri who works in the local shop Windtek and is looking forward to learning to windsurf on his Club Vass holiday for two. The Amateur winner by a slender .06 of a knot! was a WSW regular Lance Newberry who has really improved since last year and will surely be a force to be reckoned with, with his years sponsorship from Mistral and Simmer. Masters fleet was yet again won by Robin Penna who has his name on the shield a record 4th time and the Gold fleet’s winner was another Weymouth Local, Steve Corps. The overall winners in the conditions however were the kites, with Weymouth local Jason McCaffrey taking the honours by hitting 31.56 knots. Unfortunately to qualify as counting round of the ISWC world tour and the UKWA championship, 25% of the fleet are required to exceed 30 knots for a round to count which was not achieved, so the winners of Spartan UKWA and ISWC British Championships will not be crowned for 2009. Average points will be awarded for those ISWC and UKWA members to count towards their world tour ranking. The only strong winds on the weekend were good news for the youths who can only compete then. This fleet continues to grow in popularity with lots of new and old faces on the course. This fleet is super keen, out long before the course opens and last to come in. Unfortunately the wind disappeared for the rest of the week with only a light wind race on Friday. The race crew did a great job in entertaining the competitors with SUP races and even commandeered a dragon boat for a GPS challenge to the rest of the fleet. This combined with a full evening social calendar made for a very enjoyable week despite the lack of wind. Windsurf 4 Cancer Research is the weeks chosen charity and thanks to the generosity of the riders who all had a ticket but bought more for a raffle for a Fuerteventura holiday organised by 7th Wave, £321 was raised. Finally thanks to the event sponsors, Dakine (The event Polo shirts were excellent this year), Tushingham, Spartan, Simmer, Mistral, Club Vass, www.gps-.speed.co.uk, www.gps-speed.com, Predator cameras, 7th Wave Fuerteventura, Windtek, Natural Design, AYRS.